Boston is my favourite American city. When I was lucky enough to travel around some of the most famous parts of America this summer, I expected New York or San Francisco to be at the top of the list, hands down. Although these cities were undoubtedly incredible, there's just something about Boston that made it deserve the top spot. When I visited, in early August, the weather was beautiful. It reached 34 degrees on the first day and there wasn't a cloud in the sky. Perfect weather for frozen yoghurt of any flavour you could possibly imagine. If you can't decide, there's always the option of mix and match. I opted for banana and pineapple which was just as refreshing as it sounds. It's really easy to get around Boston, which makes it so much more fun to visit, as there's the opportunity to see so much in a short space of time. Their tram system is simply called the 'T' and means that travelling to landmarks all over the city isn't a problem. It's even refreshing to get on the cool, air-conditioned carriages after walking around in the heat. There's plenty of green space in Boston, which, for me, is one of the most important things that a big city should have. As much as I love the hustle and bustle of the busy streets and the enormity of the skyscrapers, there's nothing quite the same as relaxing on the grass in the sunshine, watching the world go by. 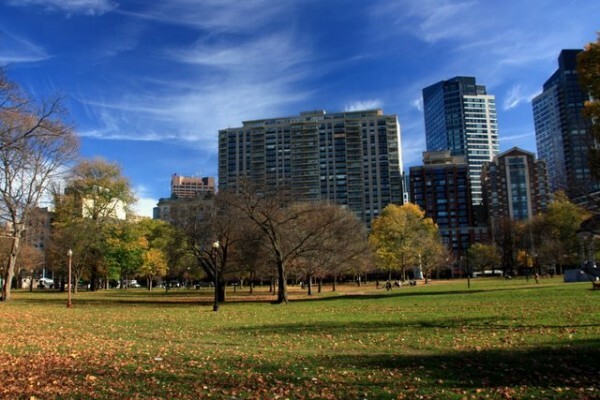 The best green spot in the city is Boston Common. It's a beautiful place to relax whilst still being in the heart of the city. For the days when it's hot and sunny there is the Frog Pond, where you can splash around or simply dip your feet into the cool water. It's the perfect place for a picnic, be it with your other half, with friends, or with a family. There are trees that offer shade from the hot sunshine and plenty of space to play games. Probably one of Boston's most famous landmarks is the Freedom Trail, a two-and-a-half mile, red-lined route which takes you around sixteen different historical sites, telling the story of the American Revolution. For those of you even remotely interested in history, this is sure to be of interest to you. The trail starts (or finishes, depending on which way you look at it) at Boston Common, the city's park and ends at the Bunker Hill monument, and the accompanying Battle of Bunker Hill Museum, which details the morale boost the Americans received when inflicting large casualties against the British in 1775. A mixture of churches, museums and other important landmarks, the trail is an excellent way to explore the American Revolution in a fun and dynamic way. If history isn't really your thing, then there are plenty of other things to do in this gorgeous city. The food in the city is amazing, with Quincy Market and Faneuil Hall Marketplace being absolute musts to visit. Whether you fancy something savoury, or you've got a bit of a sweet tooth, you're sure to find something utterly delicious that satisfies your cravings. Another foodie place to visit is the original Regina Pizzeria. Opened in 1926, this tiny but rather famous restaurant specialises in incredible pizza. Tucked away on the corner of a side street in the North End, it has a real homely feel to it, and doesn't need to boast its excellence – the pizzas do that all by themselves. Although you're likely to have to queue for a table, it's definitely worth the wait. When you're all full of delicious food, the next place to visit is Harvard. This part of the trip was utterly surreal to me. One of the most famous and prestigious universities in the world, and one that is constantly talked about and featured in films and TV shows (Legally Blonde, anyone? ); it was unbelievable to walk around the campus. Harvard is the US's oldest higher education institution, named after John Harvard, the university's first benefactor, and was officially established in 1636. There is a famous statue of John Harvard in the university square, which has queues of people in the summer, all waiting for the opportunity to rub the foot of the statue for luck. The campus is a mixture of leafy green tranquillity and beautiful buildings, including the impressive library, and is beautiful to walk around. As well as the campus itself, there is also Harvard Square, visible as soon as you alight from the T, which houses realms of coffee shops, restaurants, and Harvard University's famous shop, The Coop, which sells huge amounts of Harvard merchandise, from typical shirts and jumpers, to more unusual baby-grows and chairs. There's also a sister bookshop across the road, which is literature heaven. The layout itself is enough to blow any booklovers away, and there are thousands of books lining the glossy wooden shelves. All areas of academia are displayed, as well as hundreds of novels and poetry books. It's a gorgeous set up, with spiral staircases and comfy chairs dotted around the place, where you can curl up with a book to see if it's your thing. And for those of you who can't resist a bit of shopping, no matter where you are, Newbury Street is the place for you. 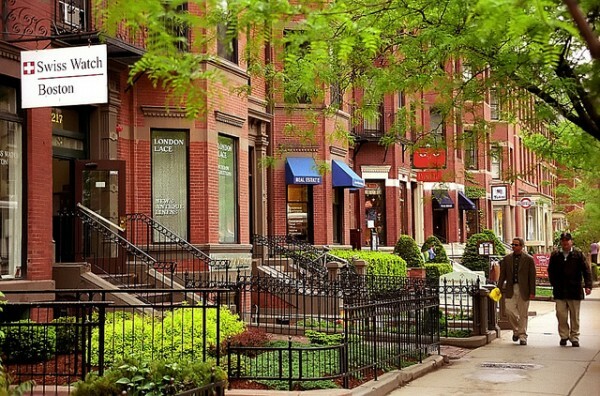 Located in the Back Bay area of the city, the street is shopping heaven. From American Apparel to Tiffany's and from Kate Spade to Marc Jacobs, there is an absolute wealth of shops that sell all varieties of clothes, jewellery, accessories and sportswear. And there isn't tax on clothes in the state of Massachusetts, meaning that everything is as cheap as it actually says on the label, which is a welcome added bonus. Boston really is a vibrant, exciting and interesting city. I wasn't sure what to expect when I visited there, as I hadn't heard as much about it as the other cities I visited, but it definitely surpassed the few expectations I had. It's a perfect mix of traditional and modern architecture, with a wealth of things to do and landmarks to see. If you do get the chance to visit the U.S., I'd highly recommend Boston as a city to visit.